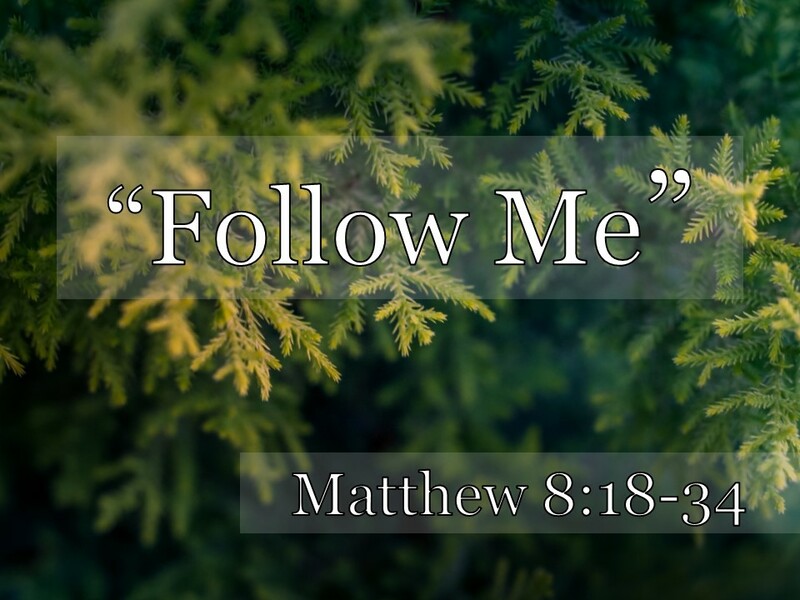 Our sermon series on the Gospel of Matthew is called “Following Jesus,” because that’s what Matthew wants us to do. Matthew wrote his gospel as a theological biography of the Lord Jesus Christ–the most compelling person that ever lived and ever will live. Matthew set out to introduce us to Jesus and to hear Jesus’ call to discipleship. And that’s what we’re going to hear again today. 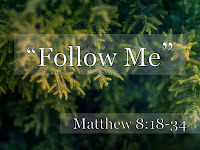 In verse 22, Jesus says, “Follow me.” And that’s what I want to make the title of today’s message. It’s not the first time that He’s said it in the Gospel of Matthew. Back in January, we memorized Matthew 4:19. Remember that? He calls us to follow Him and to persuade others to follow Him, too. Today, I have only one point to make. Just one. FOLLOW JESUS BECAUSE THERE IS NOTHING AND NO-ONE MORE IMPORTANT. Jesus calls us to follow Him first and foremost because there is nothing more important and there is no-one more important in all the world. So those are the stakes this morning. There is nothing more important than following Jesus. Let’s see how this plays out in Matthew chapter 8. Two weeks ago, we jumped to the end of Matthew chapter 9, the end of this bigger section of Matthew, and there, when Jesus saw the crowds He felt compassion on them. He is not running away, but He is getting away. He’s taking a kind of retreat. When we left off last week, Jesus was giving them all a foretaste of the kingdom at Peter’s house in Capernaum. He was casting out evil spirits, healing all the sick including Peter’s mother-in-law. He was exercising great power and authority. But Jesus didn’t want them to get addicted to His miracles, and He needed a little time away. So He told his disciples to get a boat together and set off across the Sea of Galilee. I don’t know about you, but that sounds really good to me. That sounds like something we ought to be saying to Jesus. It sounds like something we might sing on a Sunday morning in a hymn or a worship song. But Jesus doesn’t seem that impressed. It may be because he’s a teacher of the law, a scribe. And we know from the Sermon on the Mount, what Jesus thought about the scribes in general. And it might have been because this guy had his focus on what he was going to do for Jesus not how worthy Jesus was. I will follow you wherever you go. Yes, I will. What do you hear there? Jesus is not discouraging the man from following Him. He’s disabusing him of his mistaken notions of what it will be like. Following Jesus is more important than our comfort. But at the same time it’s a hard road to walk. Following Jesus is a hard road to walk. A narrow road, He called it. Have you ever thought about how we who are Christians follow a homeless man? My Savior was a homeless man. And He has not promised me an earthly home. He often provides them. But that’s not the promise. The promise is an eternal home. And between now and then there will be trouble. We don’t know if this guy kept on following Jesus or not. We do know that Jesus is looking for real followers. Not just the ones who say they are going to follow Him and then bail when the going gets tough. I hope the answer is everything. Because He’s worth it. But so often we hold onto thing. We hold onto our comfort. We hold onto our money. We hold onto our family. Which sounds totally reasonable to you and me. Right? Whoa. Those are strong words! Why did Jesus get so salty with him? There are two possibilities. One is that the man is asking for basically a year off of discipleship so that he can follow all of the traditions of caring for your deceased parents. That included the funeral and then actually digging up the bones many months later and putting them in an ossuary. And settling the estate. Gotta make sure the money is all there and in the right place. And, then I’m all yours, Jesus. The other possibility that I think is even more likely. The man’s father isn’t dead yet. And maybe he isn’t even sick! This guy is asking for a indefinite deferment of his discipleship. In either of those scenarios, it’s Dad first and Jesus second. Right? V.21 again. You are important, sure. But this is my Dad! Have you ever said something like that to Jesus? You are important, sure. But this is my Sleep! You are important, sure. But this is my last one (my last dollar, my bite, my last year, my last chance). That’s why Jesus is so up in his face. He’s not saying that we should dishonor our father and mother. Jesus is big on honoring them. But that is not more important than following Him! That’s the priority of the spiritually dead. Let them put second things first. We need to put first things first. And Jesus is our first thing. Follow Jesus FIRST AND FOREMOST because there is nothing and no-one more important. Now we know why He needed to get away. He was TIRED. There is a furious storm. The Greek word is the one for earthquake. There was an earthquake of a storm attacking their boat, and Jesus is asleep. How about the rebuke from Jesus? In the Greek the phrase is “oligopistoi.” “You of little faith.” Jesus used it already in the Sermon on the Mount when He was talking about worry. Oligopistoi? Why are you so afraid? The answer is because we know about the storms! We can feel the wind and the waves. Now, they were right to turn to Jesus. So they had a little faith and it was directed toward the right person. But Jesus thinks that they should have known by now that they wouldn’t drown in any boat that He is in. That’s not how He’s going to die! I don’t think they did. And don’t make it all mythical. Jesus can calm the storms in your life. That’s true. And I guess it’s even an application of this story. But this story is history. Jesus actually talked to the storm, and it had to obey Him! Only the Creator does that. Who did that? Who alone is like that? Only God. Follow Jesus because there is no-one more important. Following Jesus means putting your faith and trust in Him. It’s believing that Jesus is God incarnate, God-in-the-flesh. Believing that the wind and waves obey Him. Jesus is not just a great teacher. He is a great teacher. On Back-2-School Sunday, we can safely say that there was never and will never be a greater teacher than the Lord Jesus Christ. And we just studied one of His greatest teachings, the Sermon on the Mount. But He is not just a great teacher. He taught with a greater authority than anyone ever before Him. And His authority is not just over words and concepts and ideas and truth. It’s over matter and energy! And that should cause us to worship Him in reverence and awe. That’s why we are here today. Because we worship Jesus. He is worthy of our worship. There is no one more important. One more story. And this is a weird one. Matthew is the only gospel writer that tells us there were two of them. Probably one was the more violent and scary and so he got all of the attention from Mark and Luke. But Matthew tells us that there two. And nobody could pass that way because these two guys were possessed by evil spirits. Unclean spirits and living among the dead in the tombs. Very very unclean! Very very powerful. But not too powerful for Jesus. V.29. The demons speak. Notice the answer to the question of verse 27. And they have a question for Jesus. Are you here to torture us before judgment day? Yes, the same lake that the disciples just thought they were going to drown in. It’s now full of deviled ham. It teaches us that people are more important than animals. It teaches us that there is an appointed time for demons to be punished. It teaches us that demons know that Jesus is the Son of God. But I think, most importantly, it teaches us that Jesus IS the Son of God. That He has authority and power not just over the wind and the waves but over the unseen spirits that inhabit the heavenly realms. Even the unclean impure evil demonic spirits are subject to Jesus. What does Jesus say in this story? What speech does Jesus make? He just says one word, right? He just says to these demons (the other gospels tell us that there are a legion of demons and 2000 pigs). He just says one word. And it’s all over. There is no one more powerful than Jesus. There is no one more important in the whole world than Jesus. Here’s the scary thing though. Not everybody does. Look at verse 33. Will you please go away? That’s what they said to Jesus. Perhaps they were scared of Him. They were scared of the demon-possessed guys. And this guy says one word and all pig hell breaks loose. Imagine the squealing violent scary sight that was when those pigs went and drowned themselves! But I doubt they asked Him to leave because they were scared. I think they were mad. I think they had just lost what was most important to them. That was their bank account. Jesus just sent all of their bank accounts to the bottom of the sea. He just tossed all of their wallets into the lake. He just hit delete on all of their accounts. I think their story is in here as a cautionary tale for you and me. Because they encountered Jesus and decided NOT to follow Him. They had decided that there was something more important than Jesus. Today, Jesus is inviting us to follow Him. But to do that we have to count the cost. We have to ask ourselves what we are willing to give up. You see salvation is absolutely free. But it is not easy. Salvation is by grace through faith and not by our good works. But Jesus saves us to do good works. And He calls us to follow Him no matter the cost. He is more important than our comfort, than our family, than our money. There is nothing earth and no-one in the universe more important than Jesus. And we have Him, then we have everything. 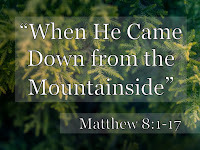 [Matt's Messages] "When He Came Down from the Mountainside"
We’re back where we belong in the Gospel of Matthew. Last week, we skipped head of ourselves to the end of chapter 9, but this week, we’re right back where belong– right at the end of Jesus’ Sermon on the Mount. For three power-packed chapters, Jesus has taught with unparalleled authority. He has taught about the inside-out upside-down kingdom of heaven of which He is the coming King. He’s invited us to join that kingdom and follow Him. To repent for the kingdom of heaven is near. To seek first, before anything else, His kingdom and His righteousness. And to build our lives on His authoritative teaching so that when the storms come, our lives do not crash but stand firm. And now we find out what happens next. What happens when Jesus comes down from the mountainside. Here’s what happens: Jesus shows that He is the King. If Jesus has been showing that He is the Messiah who was to come through His words in chapter 5, 6, and 7, now in chapters 8 and 9 He shows that He is the Messiah who was to come through His deeds. There are many many miracles here in chapters 8 and 9–healings, exorcisms, control of nature, even a resurrection of a dead girl. And all of these miracles, these demonstrations of Jesus’ power point to His identity. They reveal Who Jesus really is. And sprinkled through all of those are calls to discipleship. We’ll see that strongly next week. Jesus doesn’t just heal people. He calls people to follow Him because of Who He really is. He calls people to trust Him because of Who He really is. This week, because we don’t have much time, we’re just going to look briefly at the first 3 short stories. They are all healing stories. 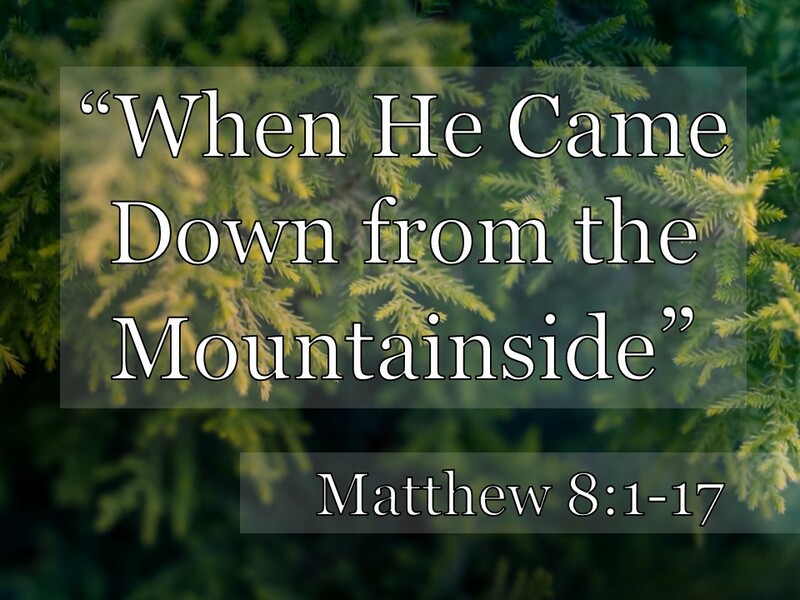 Healing miracles that Jesus did after He came down from the mountainside. They might not be in chronological order. Mark and Luke put them in a different order in their gospels. The chronological order wasn’t as important to Matthew as the theological message was to him. Matthew is committed to revealing to us Who Jesus really is. And we get that through not only hearing what He taught but seeing what He did when He came down from the mountainside. We saw that last week at the end of this section, at the end of chapter 9. Jesus always had an eye out for the harassed and the helpless. The outcasts, the outsiders. Nobody was more outcast or outsider in Jesus’ day than a leper. If you had one of those infectious skin diseases that fell under the general category of leprosy whether it was Hanson’s disease or not, you were an outcast. You were lonely and ostracized and alone. Nobody touched you. You had to live outside of the camp, outside of town. Because the Law said that you weren’t just sick, you were ritually unclean. You were defiled. And if you touched others, you would defile them. They would become unclean. Can you imagine what that felt like? Some of you can. Some of you carry around so much shame, you feel like this all the time. You feel alone, and dirty, and untouchable and unlovable. #1. HE BROUGHT TOTAL CLEANSING. V.1 again. He says, “You can, if you will.” That’s faith! And Jesus does the most amazing thing. The last thing you might expect this Jewish man named Jesus to do. Jesus didn’t become unclean. The man became clean! That’s amazing! That’s the opposite of how it was supposed to work. If you touched a leper, you became unclean. But Jesus touched a leper and they became clean. Totally you can take it to the bank you are clean. That’s the point of verse 4. Leviticus 13 and 14 give Moses’ instructions for what to do when you think you’ve been healed of your leprosy. And this guy gets to go do it. And it’s 100%. It means that he can enter into society again. He won’t be an outcast. He won’t be an outsider any longer. He can be touched. He can be included. You know leprosy in the Old Testament was a picture or a symbol for sin. It wasn’t sin itself. Uncleanness was not sinfulness. But it was visual parable of sinfulness and how sinfulness is sickness and defiling and affects others. So when there is healing like this and cleansing like this, it is a picture of salvation. And when we are cleansed from our sins, we are brought into fellowship not just with God but others. So this total cleansing is a picture of the total cleansing we can have when we come to Jesus by faith and all of the blessings that come with it. Now in the second story, there is another kind of outcast. This time it’s a Gentile, a Roman Centurion, a military leader over a 100 soldiers. Now he may have been in charge of his regiment but he was a long way from home and the Israelites were not happy to have him around. As a Gentile he was an outsider. Way outside. #2. HE BROUGHT TOTAL AUTHORITY. This guy knew about authority. He was part of a great chain of command that stretched from Caesar to him so that when he told his men to jump, they asked, “How high?” on the way up. And what’s amazing is that this Centurion thinks that Jesus has that kind of authority over PARALYSIS and SICKNESS and SUFFERING! And that kind of faith is astounding to Jesus. You want to surprise Jesus when He was here back in the day? Trust Him fully. Give Him your unlimited confidence. Especially if you didn’t know that much about Him. I mean this guy was a Gentile! He didn’t have the Old Testament! He hadn’t been expecting a Messiah for thousands of years! That’s a sick burn if I ever heard one. This guy gets it. Where are you guys? He has total faith in my total authority. That was the question that He was asking at the end of the Sermon on the Mount, right? You going to enter through the narrow gate? You going to build your life on my authoritative teachings? Or are you going to go your own way? On the broad road. Building your life on the sand. And He says that there are more on the way. V.11 again. Because they didn’t accept their Messiah. Because they didn’t receive Him. Because they didn’t trust Him. They didn’t entrust themselves to Him. These people reject Jesus. They don’t have faith. So they will have agony and sorrow and anguish and eternal despair. Weeping and gnashing of teeth. But it doesn’t have to be that way for you and me. Jesus invites us to trust Him like this Centurion did. Total faith in His total authority. You don’t have to be Jewish. You can be a Gentile from Pennsylvania! All you have to do is put your total faith in His total authority. And you will take your place at the feast with Abraham, Isaac, and Jacob in the kingdom of heaven! Did you know that Peter was married? How would you like to be Peter’s wife?! Apparently he had a house in Capernaum. And his mother-in-law lived with him. By the way, this is another kind of outcast. I don’t mean mother-in-laws! I mean women in general. In that society at that time in history women didn’t have much status or social standing. They weren’t lepers or Gentiles, but they weren’t respected all the time either. In some situations they were treated worse. But Jesus always lifts up women. He always improves their lives. The point of that is not that He was worthy of her service. The point is that she was healed so completely that she felt like making dinner! She felt like getting up and setting the table! #3. HE BROUGHT TOTAL SALVATION. No disease was too much for Him. No evil spirit had any chance against Him. There is no question about Who Jesus is. Jesus is the Messiah who was to come! Jesus is the King of the Kingdom of Heaven! All of this healing? It was a foretaste of the kingdom to come. When all of the evil spirits are gone. When every disease is gone. When every sorrow is gone. When every tear is wiped away. When there is no more pain, no more sickness, no more death. That’s what this is was a foretaste of. That’s what was going on that evening at Peter’s house in Capernaum. King Jesus was bringing the Kingdom. Total salvation. Body and soul and world. All made new and right again. But we know what it’s going to take to get there, don’t we? Jesus knew what it was going to take to get there. Matthew knew what it was going to take get there. That’s why He brings in Isaiah 53. When He came down from the mountainside and then went up on the mount of crucifixion. yet we considered him stricken by God, smitten by him, and afflicted. To bring that total salvation, Jesus went to the Cross. Have you come to trust in Jesus for your total salvation? All of the cleansing you need? All of the blessings that come with that cleansing? If you haven’t, I invite you totally trust Him now. If you have, I invite you to totally thank Him now. What He did for us! He didn’t have to take up our infirmities. He didn’t have to carry our diseases. He didn’t have to get punctured for our transgressions. And all He’s asking from us is total trust and to follow Him with all of our lives. That’s not too much to task. He gave His all for us, let’s give Him all of us for Him. [Matt's Messages] "When He Saw the Crowds"
We should be in Matthew chapter 8, verse 1. We are in a long term series working through the theological biography of Jesus called The Gospel of Matthew, a series we’re calling, “Following Jesus,” and we just finished the section normally called “The Sermon on the Mount” Matthew chapters 5 through 7. So, the normal next step would be to watch Jesus come down from the mountainside and see what happens next. I’ll tell you what happens next. Jesus goes right back to healing people, calling people to follow Him, and working amazing miracles that reveal Who He really is. We’ll see that next week. But as I was reading ahead, I got stuck on this paragraph, Matthew chapter 9, verses 35 through 38. I’ve preached it before several times. It’s very meaningful to me and probably very familiar to most of you. But as I was reading it this week, I was thinking especially about the Good News Cruise. And our hopes for what will happen here on our campus this coming Saturday. This passage is about the mission that Jesus is on and the mission that Jesus calls us to, as well. We often think of it as a missions text. International missions. But it’s just a relevant to our living the missional life here today. I think of this passage of Scripture as a guide for how to do the Good News Cruise. As we watch Jesus see the crowd and react to the crowd, I think it shows us how we are supposed to see the people who will be visiting our campus and how to think about them and pray for them and try to reach them with the gospel. So, let’s skip ahead to chapter 9, verses 35 through 38. Keith Folmar likes to remind us that the Good News Cruise is not primarily about cars. It’s primarily about...people. And every year we get more people here on our campus. There’s a sea of people out there between the cars. How should we look at them? How should we see them? What should be our perspective on these people who are our guests? I love to walk up and down the aisles of cars at the Good News Cruise. Not so much to look at the cars themselves–though there sure are some beauties out there. But more to look at and talk to the people. One year, Keith was looking for me at the cruise-in, and he easily found me and said, “I knew where you’d be–out there the middle somewhere talking to someone.” That made me feel good that I could be predictable like that. There’s a lot of different kinds of people here at the cruise, aren’t there? There are people like you and me in significant ways, and there are people not like you and me in significant ways. I look around at the crowd, and I have various initial reactions when I see these people coming. What is your initial reaction? 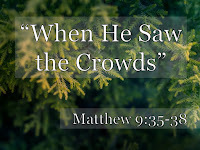 In Matthew chapter 9, our Lord Jesus sees a large crowd. In fact, he sees more than one large crowd. In this stage of His life and ministry there were many crowds that He interacted with. He was like a rock star at this point between His teachings and His miracles. Especially the miracles. 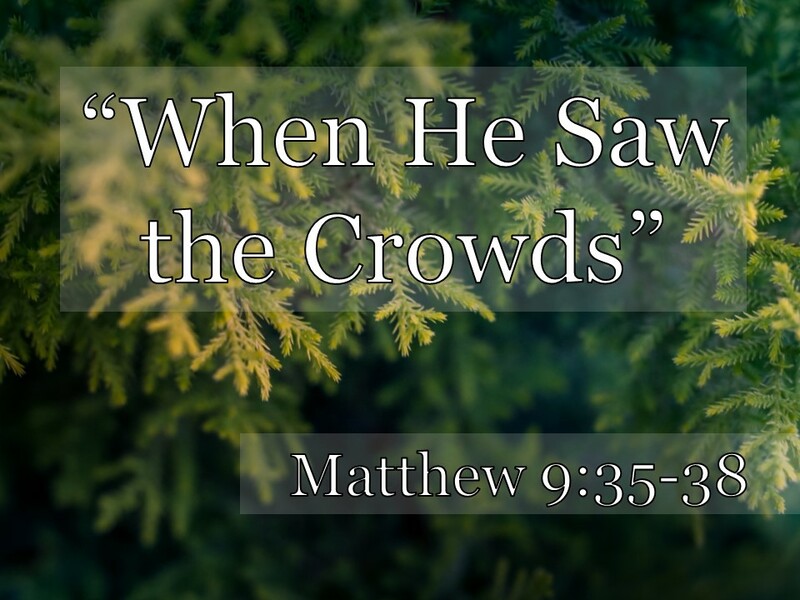 What did Jesus see when He looked at the crowds? Our Lord often sees things differently than we do, doesn’t He? Our Lord often sees things differently than we do. I think this passage tells us about our Lord’s perspective and shows us what to see when we look out at the crowd at the Good News Cruise. Three questions for us this morning. Here’s number one. #1. DO YOU SEE THE PEOPLE? In verse 35, we get a bullet-point description of Jesus’ work in these early years of His traveling ministry. It’s really a bookend to the section that began in chapter 4, verse 23. It sounds almost just like 4:23. There are three main actions of Jesus: teaching (in synagogues), preaching (the gospel of the [upside-down, inside-out] Kingdom of God), and healing (all kinds of diseases and sicknesses). We’ll see more about that next week. It was a very busy period of time for Jesus, and He was on a mission. But in the rush of ministry, our Lord did not fail to notice the people. Everywhere He went, Jesus saw people. Big people, small people, clean people, dirty people, rich people, poor people, hungry people, sick people. People, people, people. The Greek word for “compassion” here literally means to have your guts wrenched in pity and sympathy. Uggh. He felt it right here in His gut. When Jesus looked out and saw the people, he just grieved in His spirit with a gut-wrenching feeling. Uggh. It hurt Him to see people like this. I mean it. It hurt. What do you think a sheep is like that doesn’t have a shepherd? I’ll tell you in one word: LOST. Sheep are dumb animals. I’ve said this many times, and it makes me laugh every time. Sheep are so dumb they can get lost by walking into an open garage and then not being able to figure out how to escape! If sheep don’t have a shepherd, they don’t have a leader, they don’t have a provider, they don’t have a care-taker, they are done-in, they are a lost cause, they are helpless. And Jesus, when He looked out upon the crowds of people, saw shepherdless sheep. They were harassed and helpless. They had forces at work against them which were way too powerful for them to stand against. They were in danger and in turmoil. And our Lord felt compassion for them. Jesus loved the shepherdless sheep. Jesus loved lost people. Do we see the people? Do we see how they really are? Not just the cars. But the people. Do our hearts break when we see and interact with lost people? Or are we too complacent and self-satisfied and self-centered? Do we love the lost? Or are we, rather, repulsed by them? I firmly believe that our biggest problem in evangelism is not that we don’t know what to say. I think that many of us here know what the gospel is. I believe that our biggest problem in evangelism is a lack of love. I know that it’s my biggest problem in evangelism. Our hearts are not moved by the plight of those who do not know Jesus Christ as their Shepherd. And if we don’t, he said we aren’t acting like Jesus. Because Jesus did this for us! Jesus looked at our helplessness before sin. He looked at our harassment by Satan. And He took pity upon us. It hurt Him to see how we were. Ugh. Jesus loved us, even though there was nothing in us to commend us to Him. We were His enemies! And yet, Jesus pulled us to Himself with covenant love. If you are a Christian today, it is because Jesus saw how harassed and helpless you were without him...and He compassion on you! And so we should do the same. When I say the word MUSLIM, what happens in your heart? Do you feel anger? Do you feel revulsion? Do you feel fear? Or are you moved with compassion? Muslim people are lost people. And we should love them. Not because Muslims are innately lovable, but because Jesus chose to love them, you and I should have our guts wrenched with an ache for their salvation. I’ve heard supposed Christians call them, “Towel heads,” and hope they get out of our country. Yuck! There are over 1.1 billion Muslims in the world. 80% of whom have never heard the gospel–ever! I read a statistic this week that of the 350,000 Christian missionaries in the world, only around 5,000 of them work in Muslim countries! Not that I expect there to be many Muslims here on Saturday. But the question is do we care? When I say the words POOR PEOPLE, what happens in your heart? Do you squirm? Do you feel revulsion? An aversion to talking about poverty? Over a billion people in this world live on about one US dollar per day. 3 billion live on less than $2.50. Every day, around 10,000 people (most of them children) die from the results of dirty drinking water. There are 68.5 million refugees in this world. And 85% of the world’s poorest countries lie within the 10/40 window: the least evangelized part of the world. In other words, if you are poor, you are harassed, helpless, and have a much smaller chance of hearing the gospel. And do we care? Do we see the people? Your neighbor down the street with the loud dogs, the beer cans in his yard, the raucous parties on Saturday night, the four-wheelers peeling over your newly planted grass? You see him coming your way...what do you do? Turn away? Walk down the other side of the street? Do you fear for His soul? Or do we care too much for our comfort, our convenience, and our security? What are you going to see when you look out at the people on Saturday? You know, in saying that they are harassed and helpless, I don’t mean that some of don’t look really good. They clean up well. They have a nice looking car. Many of them are good upstanding moral people. And we can learn from them, too! We need to be careful labeling people as lost or helpless and make it sound like if they were just smart people like us then they’d have it all together. And they have nothing to offer others. That’s far from the truth! But we know what we were like before we knew Jesus, right? Harassed and helpless like lost sheep. When you go to Sheetz, and there are bunch of people in the line. When you look out here and see community people on our playground. Do you see single moms that are struggling to make it? Do you see people trapped in addictive behaviors? Do you see sheep that don’t have a shepherd? In my job, I talk to a lot of people. And sometimes, it’s easy to get “compassion” fatigue and to stop caring. I struggle with that a lot. I want to be a compassionate person, but I get tired. I get weary. I’m sure that Jesus got tired. But when He saw the crowds, He got compassionate. What do we see as we as we look out on our community? Do we just see our school, our post offices, our truck stop, our families, our things? Or do we see shepherdless sheep who are harassed and helpless without Jesus? That’s why we do the Good News Cruise. Keith has written up a little message called “Tuned for Life” which is about our theme this year. It will go in all of the goodie bags that we’re going to pack on Thursday night. He talks about spark, fuel, and air. Because we want to see people the way that Jesus sees people. Jesus, looking at these Shepherdless Sheep, sees something more that we often don’t see–potential! #2. DO YOU SEE THE POTENTIAL? Jesus looked at those people [sinners–every single one of them], and He saw some potential followers. He saw a church that He was going to build using lost people. He saw a harvest of souls won to the gospel of the kingdom–won to the King. Do we see the potential? Everywhere you go, among all the people you see, are the elect of God, sprinkled throughout humanity. Do you see potential Christians everywhere you go? Some of us see the lost, and feel their lostness, but we don’t feel hope for them. We see their harassment, and we see their helplessness on their own. We see their shepherdlessness. But we miss their potential to be Shepherded. That’s a big part of my problem. I see the lostness. I feel it in my gut. But often, so often, too often, I have a hard time envisioning what God might do with them if I am bold enough to allow Him to use me. But Jesus sees redeemable humanity among the lostness. He did in me! He saw beyond my sin and my guilt and my shame. And He went after me. He saw the potential harvest in me. Not that I had anything to offer Him. I didn’t qualify for even one of His gifts to me. But He knew what He was going to do with me. And I’ll be forever grateful. That co-worker who bugs the living day-lights out of you could soon be your brother in Christ! Your landlord who just about steals your hard-earned money, might soon be your sister! Your hard-hearted father who has never had anything good to say about you or to you, may soon become a fellow Christian! Some person you’d rather despise that is walking up and down the aisles of cars next week, somebody who is basically your enemy, might soon be part of your spiritual family! Because the Gospel is the power of God for the salvation of everyone who believes! Ask the Apostle Paul! God is in the business of changing murderers into saints. You and I need to ask God that we begin to see every lost person we come into contact with as a potential Christian. They won’t all turn to Christ. In fact, a depressing number of them will take the broad road that leads to destruction that Jesus was talking at the end of the Sermon on the Mount. But we have no idea who will. And Jesus wants Shepherdless Sheep to have a Good Shepherd! Do you see their potential? Do you see how we need to pray? #3. DO YOU SEE HOW WE NEED TO PRAY? If you see the lostness of people and your heart is broken. If you see how many people God desires to save through His gospel. Then pray. Ask the Lord of the Harvest to send out workers into the harvest field to bring those Shepherdless Sheep to the Good Shepherd. Do we pray for more workers? There are 7.6 billion people on the planet today. Most of them do not know Jesus Christ as their personal Lord and Savior. The current missionary force that we have will not reach the world. We need to ask God to send more of us into the world to reach the world for Jesus Christ. Next weekend, we’re going to have a special missionary guest, Sarah [I can’t say her last name so we just say, “Kay.”]. She has been called to go serve the last, the least, and the lost in Panama. She is called to work with orphans. I’m sure that seeing them will break her heart. Sarah Kay is going to be with us at the Good News Cruise and she’ll be here on Sunday to share her story with us. She has heard the call of the Lord of the Harvest and is going out into the field. And we need to pray for MORE. It will only happen through prayer. That’s why we have the Harvest Prayer Time every month. Last Saturday of every month, a group of believers meets in the prayer room for one hour to pray the whole time for the lost. We’ve been praying for the Good New Cruise. Why does Jesus want us to ask the Lord of the Harvest to send out more workers? Doesn’t the Harvest-Lord know that there is a worker-shortage? #1. Because when we ask, we get involved. When we are praying, there is a much greater chance that we will care about what God does with these situations. It pulls us in. In fact, we are often the answer to our own prayers. What happens in the very next verse? Chapter 10, verse 1? Those who were praying are sent on a mission themselves. When we begin to pray for the person down the street who needs the Lord so desperately, often He sends us to go get them. #2. Because God gets the most glory that way. Instead of OUR amassing a missionary army, we acknowledge our need and our dependence upon God to do it. And when He raises the army through our prayers–He gets the most glory. Notice in v.38 that it is GOD’s harvest field? And that He is Lord of the Harvest? The Lord of the Harvest is most glorified when He is most needed. And prayer is the most humbling and needful act that the church can participate in. So we should pray for more workers. We should pray that people on Saturday would walk out into that crowd and share Jesus with shepherdless sheep. We should pray that we would be bold to talk to the people whose names were put in this fishbowl a few months ago. Have we forgotten about them? We need to pray for workers for our various ministries this Fall. Misty will need help putting on Family Bible Night. Teachers, helpers, game leaders, song leaders, the whole nine yards. ABC Kids, Kids for Christ, Youth Group, Prayer Meeting. Link Groups. We need to pray for these. And we need to pray for more workers to go out into the harvest field internationally. And for people to support them to get there. Abe and Jordyn Skacel still have like 25% of their support that still needs raised so they can go on campus and talk to shepherdless sheep about the Good Shepherd. Sarah Kay needs support to make it to Panama. We need to pray hard this week for the Good News Cruise. Not for enough hot dogs. Not for a bumper crop of cars. We can pray for those things. That’s fine. God cares about them, too. But that’s not what Jesus was seeing. Jesus was seeing spiritually needy people. And He was sending people who know Him and know His gospel to connect with them. So we need to pray that we would be sent out into the aisles with the gospel of Jesus Christ. “Ask the Lord of the harvest, therefore, to send out workers into”...that field right over there. Do you see how you need to pray? Is there some person in your life that drives you nuts, that you’d love to complain about on your Facebook page? That you need to pray for instead? And see them as Jesus sees that they could be. And then ask the Lord what to do. And do what He says.